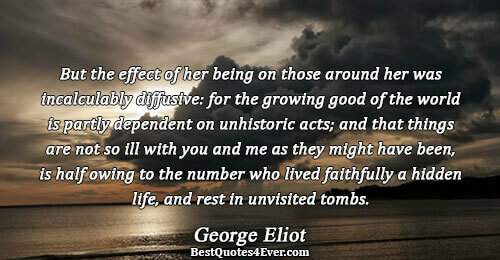 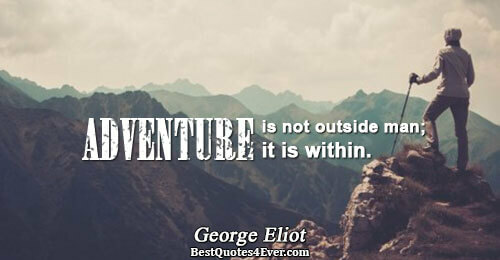 George Eliot was the pen name of Mary Ann Evans, one of the leading English novelists of the 19th century. 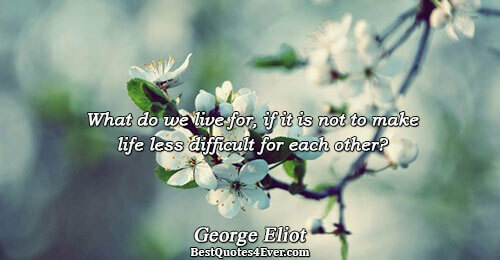 Her novels, most famously 'Middlemarch', are celebrated for their realism and psychological insights. 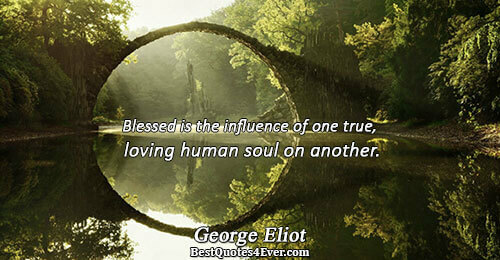 I like not only to be loved, but also to be told that I am loved. 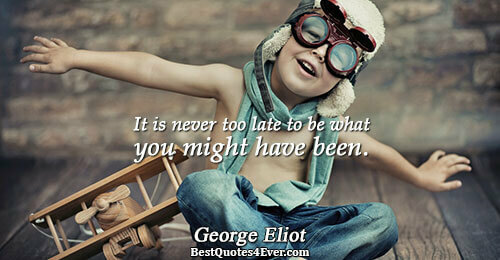 I am not sure that you are of the same mind. 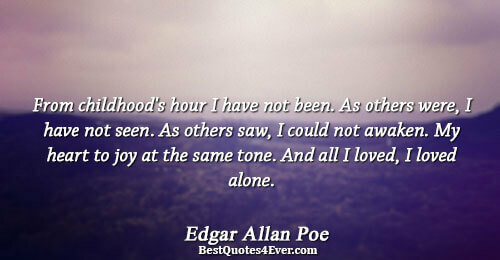 But the realm of silence is large enough beyond the grave. 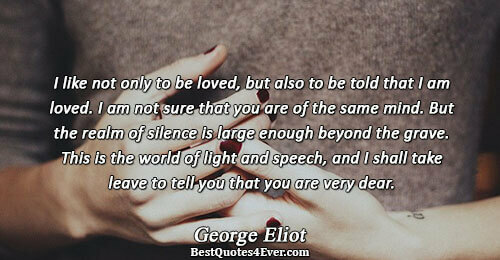 This is the world of light and speech, and I shall take leave to tell you that you are very dear. 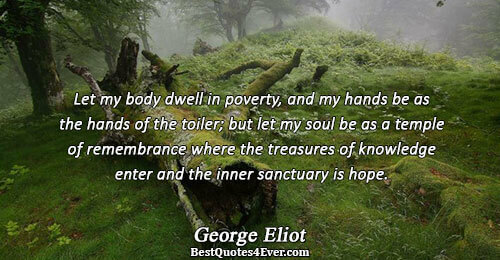 Let my body dwell in poverty, and my hands be as the hands of the toiler; but let my soul be as a temple of remembrance where the treasures of knowledge enter and the inner sanctuary is hope. 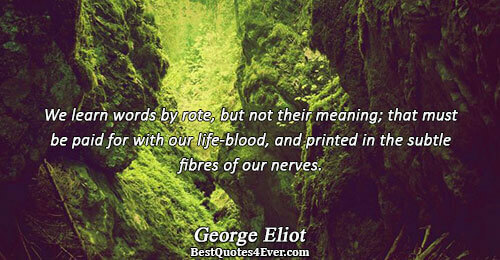 We learn words by rote, but not their meaning; that must be paid for with our life-blood, and printed in the subtle fibres of our nerves. 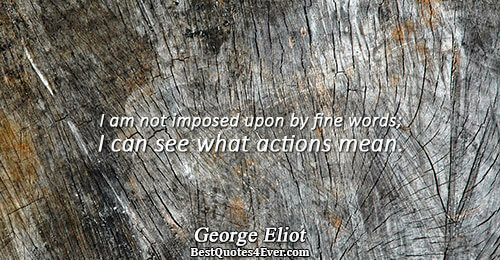 I am not imposed upon by fine words; I can see what actions mean. 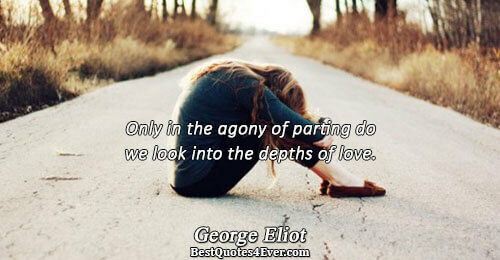 For what is love itself, for the one we love best? 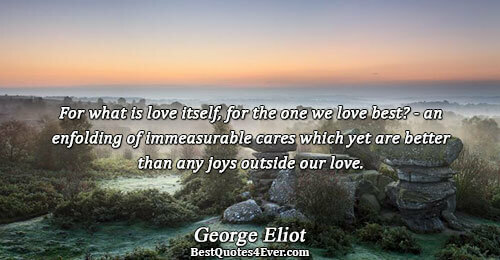 - an enfolding of immeasurable cares which yet are better than any joys outside our love. 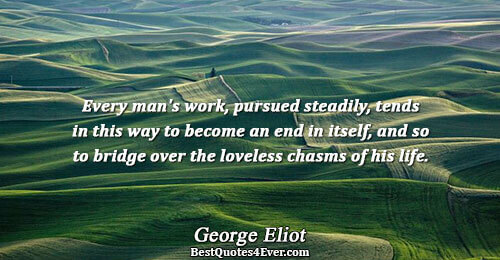 Every man's work, pursued steadily, tends in this way to become an end in itself, and so to bridge over the loveless chasms of his life. 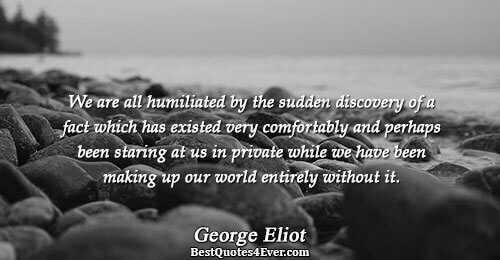 We are all humiliated by the sudden discovery of a fact which has existed very comfortably and perhaps been staring at us in private while we have been making up our world entirely without it. 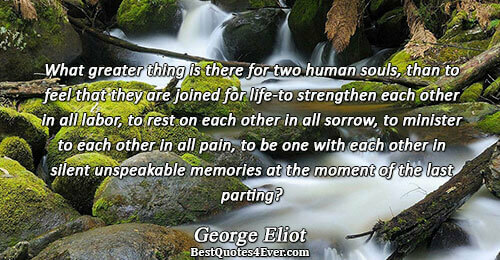 What greater thing is there for two human souls, than to feel that they are joined for life-to strengthen each other in all labor, to rest on each other in all sorrow, to minister to each other in all pain, to be one with each other in silent unspeakable memories at the moment of the last parting? 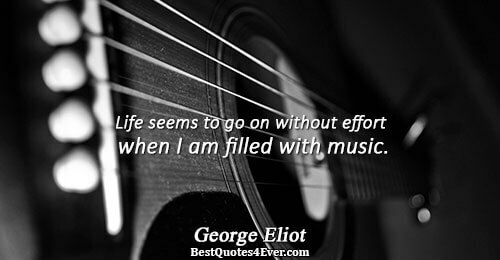 Life seems to go on without effort when I am filled with music. 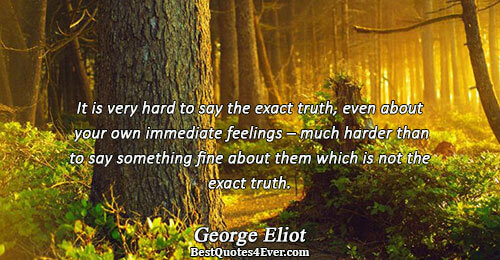 It is very hard to say the exact truth, even about your own immediate feelings – much harder than to say something fine about them which is not the exact truth. 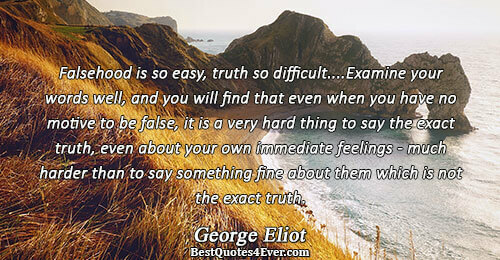 Falsehood is so easy, truth so difficult....Examine your words well, and you will find that even when you have no motive to be false, it is a very hard thing to say the exact truth, even about your own immediate feelings - much harder than to say something fine about them which is not the exact truth. 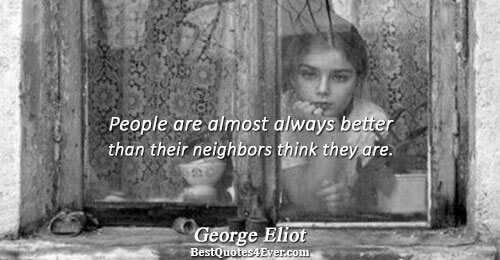 People are almost always better than their neighbors think they are. 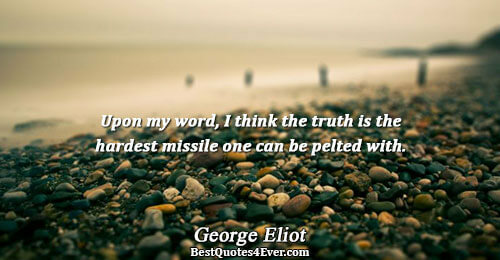 Upon my word, I think the truth is the hardest missile one can be pelted with. 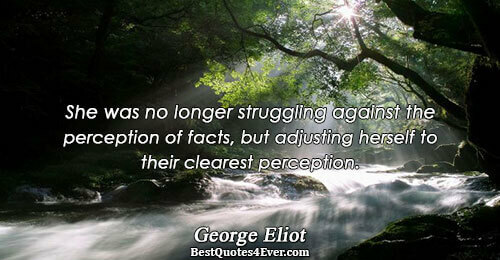 She was no longer struggling against the perception of facts, but adjusting herself to their clearest perception.